The Keiser M3i is an upgrade to the popular Keiser M3 with fully adjustable handlebars, more ergonomic designed handlebars and a bluetooth console for uploading your workouts to an App for monitoring and tracking your performance being the noteworthy improvements. Just like its’ predecessors it has been manufactured to the same high standards that have made the bike popular with gyms and those serious about their training and workouts (Spinning or otherwise). But there are a few things to take into consideration when buying this high end bike that I go through in my review. As with all spin bikes and indoor cycles you want one that you can get workouts as intense and tough as you want but when buying for home you also want it to fit well into your home, your routines and not cause issues with others in the home. The bike is popular with gym owners and they require a bike that sturdy and durable to be able to provide cycling classes to their customers, so it has passed a very demanding test in the real world and come out as being up to the job. This gives a lot of assurance that it can more than cope with use in the home. It has a steel frame that holds everything in place while you workout hard whether in the seat or out of it or when transitioning in between. You get a stable and durable ride with no shaking or moving around. If the floor is uneven there are levelers under the stabilizer bars to level the bike out and stop any rocking from side to side. For safe use in the home so you can get off the bike quickly and not be a hazard to others it is advised that you have a clear space of 2 feet on the sides and front and back. The flywheel at the reverse of the bike takes it away from sweat zone which all helps with increasing the longevity of the bikes. In addition to this the bike has a special paint coating, guards, sweat directing grooves all help to stop the corrosive properties of sweat to keep the bike in good working order and looking good. The flywheel weighs 8lbs which is light for bikes that people want to use for spinning. It is unlike the Spinner NXT (and other spin bikes with heavy flywheels) which has a flywheel that weighs 41 lbs and is perimeter weighted. The advantage of this weighting is that it pulls the pedals through to give a more of an outdoor bike feel to the pedaling motion. This makes it easier to have circular pedaling motion, which is especially good for beginners, rather than the up and down motion that can happen with light flywheels. It reduces the impact on joints making it great for those recovering from injury and those that struggle with their cycling motion. Having said all that reports by users is that the riding motion is smooth and they like how it feels on their legs. To adjust the seat and handlebars you loosen the pull-pin knobs and slide to the correct height and tighten into place. It does have preset holes where you insert the pin, however you can adjust to a point in between the holes if you want and tighten in place. It will hold in place, however, if it hasn’t been tightened fully the seat or handlebars will only slip a little way as the pin will insert into the next hole down to hold them in place. The bike can be adjusted to fit people between the heights 4 ft 10 ins and 6 ft 5 ins. Setting it to different heights is quick making it able to be used by people of different heights and sizes. The poles have markings on them to make it quicker to get to a previous setting. This all means you can quickly get on with your workout even if the bike has been adjusted since you used previously. This level of adjustability allows you to set the spin bike like your road bike or you can get it set for the best fit for proper sizing, comfort and efficiency for spinning workouts. Unlike many spin bikes this bike has marked levels with a total of 24 going from easy to very hard level of difficulty that is suitable for experienced riders – i.e. they shouldn’t find it challenging. The resistance levels are displayed on the console. The resistance is provided by magnets situated on either side of the flywheel. The resistance is increased by moving the lever just below the handlebars which moves the magnets closer to flywheel thereby making it harder to cycle against. When the magnets are moved away the cycling gets easier. The magnets never touch the flywheel so this gives a smooth and silent riding experience. The resistance does vary within the marked levels slightly as the faster you pedal the more resistance you experience. The transition between the levels (gears) is smooth so there is no jerkiness in the operation going up or down. At low speeds and low levels of resistance it can sometimes feel too easy like when you are in the wrong gear going down a hill but this is only likely to be an issue when you start your workout. Otherwise you’ll find you get a fluid and natural experience. The bike uses a belt drive that provides a very quiet and smooth riding experience. You’ll notice this is smoother than you get with a chain drive. It does feel different to riding an outdoor bike. A belt drive doesn’t require day to day maintenance like you have with a chain drive. The bike has a fixed gear which means while the flywheel is moving the pedals are moving too. You can’t coast and when getting off you need the pedals to stop moving so you can get off without risk of hurting yourself. To stop the pedals quickly you push the resistance lever away from you and this stops the flywheel and pedals from turning. The Keiser M3i comes with dual shimano pedals with one side being for specialist clipless shoes and the other with a toe basket and straps for tightening where you can slip in your athletic shoes. Both sides give a good grip on the pedals so you can push and pull the pedals around without worrying about your feet slipping off. The Q Factor on M3 bikes is 7 3/4 ins which is wider than you’d find on an outdoor bike. It is the horizontal distance between the pedals. The narrower this measurement the more your hips and feet are in alignment for most people. The benefit of this is their less stress on your knees. However, this is not the case for everyone. Most people who ride the bike are fine with this level of alignment, if you want a narrower q factor the Spinner NXT has one at 6.2 inches (but the bike doesn’t come with a console). Seat. The seat is comfortable by indoor bike standards but you may still find it not to your liking. That is the way with bike seats in general. You can try padded bike shorts or gel seat cover or replace with another seat as it fits standard size bike seats. Noise. This is a very quiet bike. The only noise you are likely to hear is your breathing. It makes it possible to use it in apartments or when others are sleeping without disturbing them. You can get a quick workout before you go to work or if you have young children then you can workout when they are sleeping if you get the chance.. Dirt and Dust. There is not much dirt and dust given off from this bike although there maybe some lubricant dropped. The biggest problem is likely to be sweat which is corrosive, so should be cleaned off the bike on a regular basis. This can also drop on the floor so you may want to place a mat under the bike to prevent it being damaged by it. Handlebars. The handlebars are covered for better grip and to prevent blisters. Although the handlebars look different to the traditional handlebars you can still place your hands in the positions needed for spinning and training. If you rest your forearms on the handlebars you may feel a little uncomfortable due to the angle and also they aren’t padded so your arms may start to hurt if you stay in that position for an extended period. The bike requires an area of 58.5 ins by 25.75 ins of floor space for storage, making it able to be stored under stairs or in a cupboard. It is a great looking bike so it can be stored against a wall without being an eyesore. The wheels are exposed so they should work on all surfaces including carpet as the pile won’t get jammed. If you have wooden floors it is a good idea to test it first to ensure the wheels don’t scratch or dent it. The bikes is relatively easy to assemble but is more involved than most spin bikes. You are required to attach the flywheel and supply your own tools. Most other spin bikes include tools for assembly and the flywheel is attached. The assembly is able to done within an hour even with the extra step. You need to add the stabilizer bars, adjustment poles, saddle, handlebars, console and pedals. The assembly tool requirements include crow foot spanners, wrenches, Allen keys and a torque wrench – although some people have successfully assembled without the torque wrench. I think why you need to supply your own tools and in particular the torque wrench as well as attach the flywheel is due to it being a commercial level bike supplied to gyms across the country rather than a bike designed just for home use. The big benefit with this bike compared to other spin bikes and indoor cycles is the ability to upload and monitor your performance with a fitness app. With most bikes, that do have a console (not all come with one), they only gives workout data while you are cycling. There is no ability to track and record performance. (The only other bikes I reviewed so far with this cpaability are the Ironman H-Class 520 and Ironman X-Class 510). It works with the GoInd App. This is available for iOS phones and mobile devices and required iOS 7.0 and later. It is not available for any other mobile device platforms restricting its usability. The App is available in Spanish and English. With the App you can store and analyze your workouts. The information is uploaded using the bluetooth capability of the console. It gives you the ability to store, analyze, graph the results of heart rate, RPM, power output and overlay them. You can also do an Functional Threshold HR test with the GoInd Extended App. The other functionality of the console is the same as you find with the Keiser M3 Plus. The only accessory that comes with the bike is the water bottle holder situated at the bottom of the frame. The bottle is held in place securely by gravity. This makes it easy to get to when you want some water during your workout and to return it without having to disrupt your workout – you don’t have to force it in to get into the holder you simply place it in there. The location of the holder does put it in a place where you may find you drop sweat on it which may make the bottle a little slippery and annoying. The most read review online doesn’t like the fact that you can only use the GoInd App with the bluetooth and that the information can’t be shared with other fitness apps. It would be much better if this information was more prominently displayed so you knew exactly what you were getting in that respect as they do make a big thing about it having bluetooth. Also I’ve yet to come across a spin bike that does offer more than this bike does in terms of connectivity. Outside of this it is well received for its reliability in most reviews and the very smooth ride, how durable it is and the stable platform. The reviews also say they like the console and its display of data while you ride. The bike is more expensive than the Keiser M3 Plus by approximately $100 (when I checked) with the major difference being that the console has bluetooth and your results of your workouts can be displayed and analyzed with the GoInd App. Being able to upload your information to the GoInd fitness App is more than you get with most spin bikes and it allows you to track and monitor performance. It would be good if the bluetooth capability allowed you to work with other Apps too but it is useful for feedback and analyzing your stats and fitness. It is a very quiet bike, looks good and is stable and durable. You can easily move it from room to room on the transport wheels. It doesn’t take up much room when not in use. All this and the fact you can get a great workout form this spin bike make it great for home use as well as the gym. If you are serious about your workouts and/or training this bike is definitely going to keep up with you and provide many hours of pain and/or pleasure (depending on how you feel). 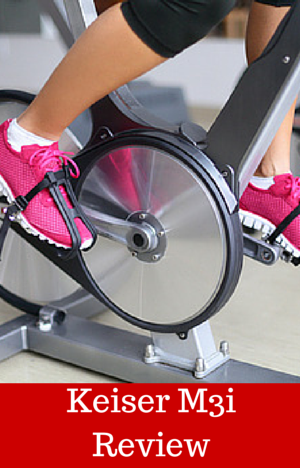 I’ve been reviewing spin bikes for a few weeks now and your review above was the crispest and easiest to follow. Thanks for taking the time to review! That’s great to hear. Thank you. Good review. I feel that Keiser could do a lot more on the software side. As someone who owns a Keiser bike, I’d like to crunch numbers in Strava and do a lot more with interactive/motivating software like Zwift. I find that even Bkool is flaky with Keiser. The bike itself is great. Thanks for these points. I agree with you its a great bike just a pity about the software – they need to spend time and effort on this. Just receive ours (16 Aug 2018). Keiser now has a bluetooth app for iOS that works beautifully with our 2-3 year old mini iPad & allows workouts to be saved to each rider’s record. It shows exactly what is on the supplied display, but is much brighter & easier to read.